I’ve been under the radar for a little, too much going, and life just keeps rolling on but today I wanted to share with you a little modification to help you with your X100/s experience. While browsing for X100s images on Flickr (something I do sometimes while I’m in bed) and I bumped into this image from a photographer named Jonni Armani and I was instantly awe struck. “Oh my,” I told myself, if I could pull this of it will be amazing. Luckily, Jonni had also published a youtube video which talks about the basics on how to go about doing this modification. I suggest you watch a few times. So off to eBay, to find the proper Leica grip. Jonni made a slight mistake on his video in referencing which Leica grip to buy but I quickly realized he meant to say the Leica M Grip 14405. So make sure, its an original Leica grip, there are quite a few knock of that you will surely want to stay way from. I quickly found one that was displayed on a Leica M6 and made the purchased. Ok, the Leica Grip arrived and it was perfect. Here are some additional tips which Jonni didn’t really go into on his video as he just mentioned his experience all of matter of fact but there are some things to know, questions I asked myself but I figured I could pull it of. You’ll need a little screwdriver to unscrew 5 screws on the metal plate. So go ahead and unscrew them and put them in a safe place. Hammer out the screw which is on the plate the original grip for the Leica. There is a little fastener that holds it place and I couldn’t remove it for the life of me, so I did as Jonni mentioned – hammer it out. Its kind of difficult to remove the metal plate from the black casing underneath even with the screws removed, so you’ll want to hit the the tripod hole a little bit, not to hard and it will pop out after a few slights knocks. Now you should have the metal plate remove and the other part on the side, separated. You’ll need a drill tip which has chromium or titanium (yes, they do sell those in hardware stores) since you’ll be drilling through this metal plate. Any other bit and your job will be extra difficult. Put the metal plate in a vice (I guess if you have one) other wise get a 2×4 wood block and use that , although I’m guessing it will be a bit a harder this way. Be very very careful if you use the wood because the metal plate may go off flying once you start drilling. For the record, I use the vice method. Make sure you measure correctly where to drill the hole, you’ll need a horizontal and vertical measurement to ascertain the exact position, this is critical, otherwise your hole will be a bit to the right or the left of the tripod hole on the X100s or X100 and your tripod mount screw won’t thread through. Drill slowly and carefully and in a couple of minutes you’ll have your hole. Double check it on the X100s thats on the right spot and then connect the 5 screws from step 1 and add the 1/4′ tripod mount screw and you’re done. Search on Amazon or Ebay for “tripod screw” and you’ll find quite a few options. I happen to have one laying around so I used it but I did order 4 more on Amazon in case I loose this one. Guys, it may seem like chock full but trust me its worth every penny. My X100s now feels great to hold, its a night and day difference. If you’ve ever used the X-E2 or X-Pro 1 (I have) with the original Fuji grips then you’ll know exactly how it feels, just right and a lot easier to hold as it adds a little bit of depth to the camera thus making your grip a lot more comfortable. I had always been a little jealous of the Leica Grips as they seemed to provide quite a good hold like this one a Leica X2 (note: this is not the grip you need to buy, its a Leica M Grip 14405) and now thanks to this DIY modification my X100s has a new lease on life. Possible questions you be asking yourselves. How does it feel with the WCL and TCL on the camera? I have both (in black as well) and they feel awesome, triple awesome, as the grip helps even more than the thumb grip in balancing out the camera, so when you combine both – a thumb grip (mine is a Lensmate) and the Leica grip, its like an apple pie – sweet to the taste buds. Oh but how about when you need to change your battery or media card? Well, unscrew it, change what you need, and that’s it, its a small price to pay for this level of comfort trust me. I use 16 and 32 gb cards, its really hard to run of out of memory. How does it compare with the newly released grip by Fuji with Arca swiss support for the Fuji X100 series? I don’t know as I don’t have one and intend on buying one. I already have a similar 3rd party grip with Arca Swiss support that I’ll use when the situation arises. But, I can tell you this, I’m sure its not $75 better than this DIY modification. The Leica grips range from $50-$75, I paid about $46 so I’m happy. Does it really match the X100? Yes, folks, it looks like Fuji themselves did it, its amazing I tell you. 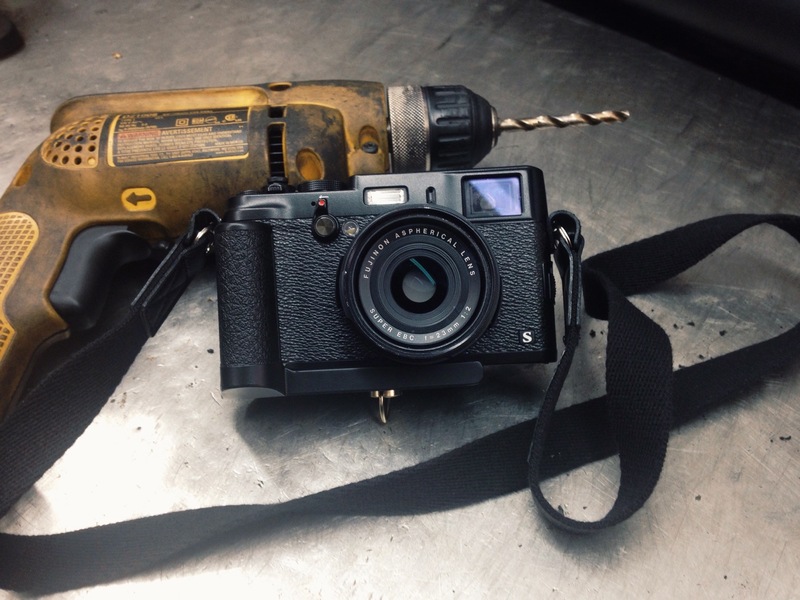 So there you have it, precise directions on how to do this modification yourself and be on your way to a better experience with our beloved X100 series. Long live the X100 ! !